I've been going to everest motors for the past 15 years and they have yet to disappoint. Excellent and friendly service, when i visit i feel at ease and assured everything is in the right hands. They are a reliable team and i have the upmost respect for them. High standard and quality service i most definitely recommend them. 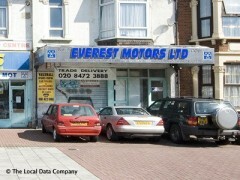 I've been using the services of Everest Motors for many years for my car repairs and MOT's and I always receive great service and sound advice. As a woman I feel totally confident bringing my car in for repair as I know they will explain what needs doing and why and then give me an accurate quote for the work needed. My daughter has just got her first car and when it needed an MOT there was no question on where she would be going. Steve and the team are a great bunch. Too expensive, unreliable maintenance. Would recommend elsewhere.